The UPF Paris peace tour event took place at the Georg V Auditorium right beside the most famous sights of the city—the Arc de Triomphe, Champs-Élysées and Tour d’Eiffel. The hall of about 400 filled up very quickly in expectation of meeting Dr. Hyun Jin Moon. There was a mixture of all of God’s children, young, middle aged and old, of all races, skin colors and religious affiliation. The young musical performers added to the sense of one big family of humanity under God. Beautiful slides illustrated Dr. Jean-Luc Berlet’s explanation of UPF’s five principles of peace. Pastor Joseph Binguimale, one of our foremost Ambassadors for Peace, testified to how Reverend Moon’s inspiration had transformed his life. It was a very spiritual and profound introduction. He was delighted to see the sons and daughters, and even grandchildren of the Reverend Moon take up the task and mission of their parents and grandparents with so much heart and devotion. When Dr. Hyun Jin Moon took the stage he was welcomed by a standing ovation. He responded with “Bonjour,” and his appreciation to be in Paris and put so much heart and depth into his Father’s Address that everybody was overwhelmed by his power and presence. Paris has been waiting so long for such a life-giving visit of God’s precious word and the gift of the World Peace Blessing. The UPF staff and families were very honored to receive Ms. Ji Yea Park, the wife of Kook Jin Moon, in Brussels, Belgium on such a beautiful bright September day. The UPF organizations in the neighboring nations of Holland and Luxembourg both sent a group of families and staff members to support our event. During lunch, just prior to the main event, a call was made to an aunt (her father's sister) of Ji Yea who is married to a Belgian man living just south of the Belgian capital. On such short notice they came and attended the event that same afternoon. Among the 140 overflow audience spreading out to the terrace were several families of three generations. The atmosphere was very warm and welcoming. The program kicked off with a flute solo and singing performance from the second generation, followed by a lively UPF Power-Point introduction presented by national leader Mr. Philippe Jacques. Ambassador for Peace Pastor Emmanuel Wanki warmly praised Father Moon's work for world peace, and there was a rousing welcome to Ji Yea for the main address, which she delivered with confidence, inner strength and warm embrace towards the audience. After the event there was an opportunity for her to do some sight-seeing in beautiful weather. She enjoyed the historical centre of Brussels, particularly the impressive Grand Place. The city of Rennes, capital of Brittany, has long been a front line of our movement in France. On the one hand, it provided the three first three disciples of Father and Mother Moon in this country. On the other hand, it is also the origin of the national hostility starting in 1975. At that time, the Catholic Church, the local media and some families united in a front determined to destroy our movement in France. The short campaign in Rennes to prepare for In Sup Pak’s arrival had some healing dimension. Local staff members met some local dignitaries, including the priest of the Orthodox Church and the local rabbi, who confessed to having very strong prejudice against Rev. Moon, against our faith, against our marriages, and against our political commitments. However, even though they did not attend the event, they expressed a sincere sympathy for our activities because we went to see them boldly and without fear. The event went well. Mr. Pak spoke with spiritual authority and was an excellent representative. Among the audience was an entire Mongolian family and another family of 4 generations. After the victory cake, there was dinner for eight with our guest speaker in a beautiful countryside setting near Rennes. Mr. Shin Il Moon, 30 years old, one of the 12 representatives on the World Peace Tour, arrived from Rome in the early morning. When he spoke unprompted about the “Olympique Lyonnais” football team, it was clear that he knew something about Lyon. Sightseeing ended at their stadium, offering him a chance to feel more directly the atmosphere of a great French club football. That day there were several good goals for world peace in Lyon! In the afternoon event, Mr. 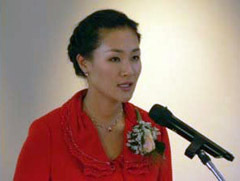 Moon delivered a lively speech with many personal experiences intermingled in the text – something of the same spirit as his grandfather, who is famous for adding extemporaneous comments to his prepared speech. This dynamic way of relating created a good atmosphere and made it easier to catch the direction of God’s Providence. Among the guests who made their way to the event were Dr. Ibrahim Beydoun and his wife, famous and influential city figures; Mr. Eitel Moutome, responsible to provide weekly free food to over 200 families in need; and Mr. Jimmy Ramarojohn, active supporter of a Madagascan welfare charity. 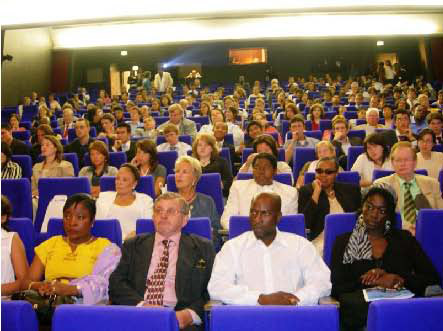 Members, Ambassadors for Peace and their guests, as three united generations were meeting in the very same hall where early Unification members gathered around the family of the first pioneer bringing Father Moon’s teachings to Lyon. Once the peace tour event was successfully completed, Mr. Moon spent time with the participants, enthusiastically engaging in discussion and posing for photographs. The village of Orsay Les Ulis is the home of the University of South Paris with its world famous science faculty. It lies some 20 kilometers outside Paris surrounded by woodland. In this beautiful area we received the World Peace Tour and the visit of the Founder's granddaughter, Ms. Shin Sook Moon. She has such a bright and joyful spirit and put her whole heart into her rendition of the core message of her grandparents. The world needs this example of true love that passes through the generations and grows in strength and righteousness. Our Ambassadors for Peace were pleased with the event and inspired to engage in the task of building the Universal Peace Federation as an Abel United Nations. It was very evident that Ms. Moon really felt good in the family atmosphere that was generated by members and guests in Orsay Les Ulis. Chartres, that most famous of cathedral cities among the wheat fields of Beauce, welcomed Mr. Shin Bok Hong as guest speaker for the peace tour event, largely organized by Mr. and Mrs. Alexander and Lucia Kempf. Among the guests was Recteur Merroun of the mosque in Evry, the largest mosque in Europe. He absolutely wanted to come and share encouraging words concerning his very positive experiences with UPF. Most guests were acquaintances from school, or colleagues from work. Mr. Hong's presence was a healing balm for all as he presented the speech with self-assurance, and his presence made us also realize that God's lineage is secure. The grand Maison des Associations, in Strasbourg’s old town, was the venue of Mr. Hyung Jin Lee. Guests arrived from France, Germany, and Switzerland, since Strasbourg is the home of the Council of Europe, the European Court of Human Rights and the European Parliament—a European enclave inside France. This diversity helped to create a family atmosphere, mingling people of all generations and nations. After a UPF presentation by City Leader Remy Vollmer, a very moving testimony was given by an Ambassador for Peace, Mr. Claude Biyoudi. He explained how Father Moon’s vision helped him to develop his intelligence of heart, and how he could on this foundation build an academy for street children in his native country of Congo. The audience received with great joy the main speech given by Mr. Hyung Jin Lee with passion and energy. How wonderful to see the third generation embracing and embodying Father Moon’s heart to liberate God and humanity! The event ended by sharing together a cocktail buffet prepared by the local community to make this special occasion a real celebration. That evening Mr. Lee had time for some sightseeing with older second generation and even celebrated a birthday. The next morning twelve gathered for breakfast where we hosted Mr. Lee for morning devotions. He shared testimonies of his blessing and experiences with members of the Moon family. It was a very warm and relaxed atmosphere. He even made time to sit in the children’s room and discuss football with them!! On a beautiful autumn afternoon, the blessed families of the Arpajon region and their guests came together at the Arpege Hotel to participate in the Three Generation World Speaking Tour. The program began with a brief cultural presentation with Juliette Martin offering a song ‘The Rose,’ followed by a traditional Laotian dance by Mrs. Mai-Cuc Moine. The Chairman’s address was read by Mr. Didier Guignard, pastor of the Arpajon blessed family community and president of French Family Federation, to prepare the audience for the Founder’s address. Mr. Hirotaka Otsuka revealed himself to be an excellent representative of Father and Mother Moon as he read the Founder’s address and communicated the depth of the message to those present. Our guests expressed agreement with the vision of peace that the UPF is advocating. We can only hope and pray that a seed has been planted through this Three Generation World Speaking Tour that will grow and bloom in the hearts of these participants, enabling all to gain an even deeper understanding. Ms. Shiori Kunitoki arrived early and could spend some time with local members sharing lunch before the afternoon event. City leader Jean-Luc Berlet explained something of the origins of Kremlin-Bicetre. The word Kremlin comes from Napoleon, who built a hospital for French soldiers injured in the Russian Campaign who returned to this city. Bicêtre is the French version of the name of an English nobleman of the Middle Ages associated with the town. Now this is one of the last communist-controlled city governments around Paris—the right place to make a meeting for peace! Certainly she appeared at ease reading the Founder's address. We felt bathed in innocence and purity. The atmosphere was very warm like a family program. The ancient city of Lille, founded in 640 AD and lying close by the border with Belgium, is the home of an energetic FFWPU community, excited to receive Ms. Yeon Sun Yu for the peace tour event. She was very natural, simple and so warm-hearted. She took pictures with each guest and embraced them so warmly. Everybody was touched by her spontaneity. The hall was full as she declared the Founder's message of peace. Eight new Ambassadors for Peace were appointed on this significant day for our city. During the event UPF Lille made a donation to seven presidents of NGOs for their work for peace, one professor gave an inspiring speech and two NGO presidents contributed with their music and songs. Massy is a town on the outskirts of Paris about 20 km from the centre of the City. It was a privilege to receive Ms. Jin Hwa Yoshida in the Comfort Hotel for the World Peace Tour of Three Generation. The afternoon program attracted several Ambassadors for Peace and their guests. 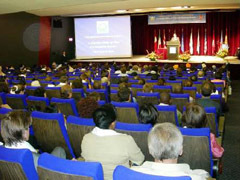 The Emcee was a member of the Collegiate Association for the Research of the Principle in Paris. Ms. Yoshida was very gracious and clear spirited in her delivery of the Founder’s Address. The Third UPF World Peace Tour took place successfully in the Mercure Hotel in the city of Nice, France, with the dedicated support of several Japanese and Korean representatives. An enthusiastic audience gathered, and people were enlightened and uplifted by the main address delivered on behalf of Father Moon by Mr. Young Jun Kim. Among the guests was a Roman Catholic priest. The audience was captivated by the high spirit generated by our speaker, who later approached each person with great warmth of heart. After the program we all shared refreshments, and later Mr. Kim could enjoy some sightseeing in the Principality of Monaco, the millionaire capital of the world.